The Mezze offers a fairly comprehensive sampling of The 405's starters. Photo by Jennifer Bardoner /Times Free Press. › Where: The 405 Mid-East Bistro, 405 Market St. Growing up in Chattanooga, I used to think ethnic food meant Italian and Mexican cuisine — and Americanized versions at that. I knew there was a whole globe full of other cultures, but to get a taste of such ethnicities, let alone a true taste, would have required a plane ticket. My, how far we've come. Now, we can visit virtually every culinary corner of the world without leaving downtown: Jamaica, Peru, India, Japan, Thailand. One of the newest countries on that list is Lebanon, as found at The 405 Mid-East Bistro. The décor reads "bistro," as opposed to "Middle East." Though straightforward and sparse, the space has an elevated feel. Navy painted walls patterned with decorative trim lend a tranquility and elegance; string orb lights dangling overhead add a touch of modernity. Cushioned benches line the walls, but the tufted faux-leather black chairs mean the seating is just as comfortable on the other side of the table. The Upside Down is a classic Palestinian dish that offers layers of stock-braised ingredients with a rotating selection of meat, though it can be made vegetarian. More than capable of housing large groups, the room is cavernous, so it felt a bit empty on our cold, Sunday evening visit. But the sleek black tables welcomed several families of other diners who appeared to be of Middle Eastern descent themselves, and many of the predominantly five-star reviews on Yelp seem to back this up, giving the restaurant high marks for authentic food and flavors. Only open since the beginning of September, the Market Street addition is beginning to gain traction, growing its customer base while already welcoming repeats, our server told us. The menu is an echo of owner Rashad Moughrabi's family restaurant in Chicago, the Nile, which has been a Windy City fixture since 1987. 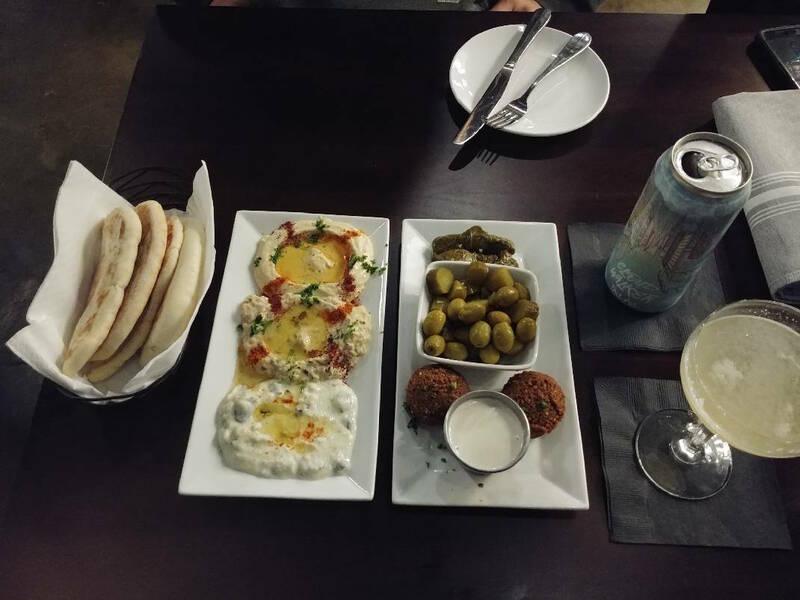 Billed as Lebanese and Palestinian cuisine, the local dinner menu features small plates of well-known favorites like hummus ($4 for a small order, $7 for a large), falafel ($3 for four, $5 for six or $7 for 12) and vegetarian stuffed grape leaves ($4). But it also offers the chance to try something new: potatoes stuffed with onion, pine nuts, minced lamb and beef, baked in a hearty tomato sauce ($15), or Shish Taouk Chicken, chunks of tangy grilled chicken breast marinated with lemon, garlic, ginger and spices and served with two sides ($14). Lunch offers pared-down versions of most of the entrees, with the addition of sandwiches. Most combine the dinner menu's main feature — shawarma — with onion, tomato and tahini sauce in a pita. There are several variations of the thinly sliced meat, marinated and stacked onto a skewer for slow roasting: chicken ($8.75 as a sandwich, $15 as a main with two choices of rice, sautéed vegetables, red roasted potatoes or side salad) and a beef and lamb combo ($9 or $17). The kifta kebab of beef-and-lamb sausage also pulls double duty, served as a sandwich for $8.50 or a full entree with sides for $14 (lunch and dinner). Priced at $6 per person, the Mezze appetizer offers a sample of most of the starters: hummus, baba ganoush, stuffed grape leaves, falafel, mashwiya (a homemade yogurt with zucchini, olive oil and garlic), plus olives and "Mid-East pickles," which appeared akin to gherkins. It is accompanied by homemade pita for dipping and makes for a nice introduction. I found the flavors to be fresh and pure, if not a little simple, but a run through the olive oil puddled on top of each dip spoke to the quality. The falafel was a standout for me: perfectly crunchy on the outside, moist on the inside, with a punch of spice that gave it personality. With lamb prominent on the menu, my boyfriend, Jon, and I at first considered getting the braised lamb shank for our main, offering a cut of the sweet dark meat slow braised and finished in a yogurt sauce, served over basmati rice with roasted garlic and cauliflower ($22). I'd had to convince him to go on this virtual visit to the Middle East, so I'd seen pictures from other diners that also allowed me to convince him to consider splitting a dish. But as is my custom, I asked our server for his recommendations. The ubiquitous shawarma was, not surprisingly, at the top of the list, but close behind was a dish unique to the local menu: The Upside Down. Noted as a "chef's favorite," it consists of meat, cauliflower, eggplant, potato, garlic and basmati rice layered into a pot and braised in stock. The pot is then turned upside down when served. The meat, and therefore the price, changes daily, offering chicken, braised lamb shoulder or braised beef short ribs, the selection that evening ($21). Like the layered presentation, the flavors stood on their own — the char-grill of the meat, the caramelized sweetness of the potatoes — but due to their subtlety, did not make for a mouth explosion when combined. Still, though I could've used more veggies, we were both satiated. This actually illustrates the sum of the meal for me: subdued yet satisfying. Our server was one of the highlights of our meal. We didn't have to ask for anything aside from recommendations. Chipper and knowledgeable, he expertly sold us on specialty cocktails (I got the Lavender? Hardly Know Her!, a slightly sweet combo of Pickinger's gin, lemon, lime, honey and lavender, $10), appetizers and almost dessert. It was clear he's been in the business long enough to know the tricks — the most important being a passion for people and your products. It's always exciting to try a new restaurant in our small city's growing dining scene. Adding a cultural twist makes it even more so. While my Americanized taste buds tend to prefer more overwhelming flavors, adventure is the best spice of all. Contact Jennifer Bardoner at jbardoner@timesfreepress.com or 432-757-6579.